Thought you might be intrested in the attached! I assume it was taken in Campbeltown as my father Danny McMillan, who is second from the right on the front row, was a Campbeltonian. He was born in 1919, so on the basis that he looks about 15/16 in the photo it would make the year around 1935. Certainly in the days when we had proper winters! I'm afraid I don't have much more information about the team, location etc. maybe someone else might be able to help out there. Does anyone have any information on this photo? If you have any photos you wish to share please e-mail these to dml@campbeltown.info or post yourself. Thanks Malcolm for sharing this with us - much appreciated. I love the football strips and the scarfs! 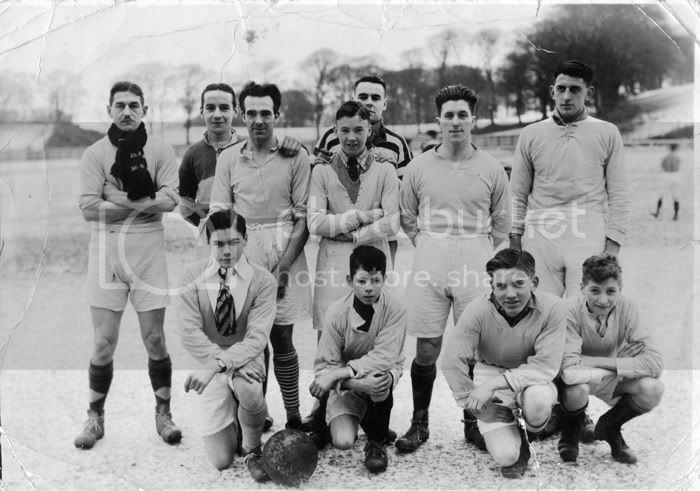 On closer inspection I think this photo was taken at Kintyre Park?